When you talk with students about their number sense and computational skills, you're bound to uncover some surprising gaps in their understanding. Knowing how to identify and bridge those gaps is essential for helping students at all levels advance as mathematical thinkers. 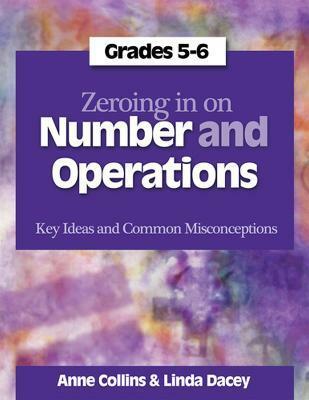 The Zeroing in on Number and Operations series, which aligns with the Common Core State Standards and the NCTM Sandards and Focal Points, features easy-to-use tools for teaching key concepts in number and operations and for addressing common misconceptions. Sharing the insights they've gained through decades of mathematics teaching and research, Anne Collins and Linda Dacey help you focus on what students really need to know and understand at each grade level. The 30 modules in the grades 5 and 6 flipchart are designed to engage all students in mathematical learning that develops conceptual understanding, addresses common misconceptions, and builds key ideas essential to future learning. The modules are organized into three sections: Whole Numbers and Operations; Fractions; and Decimals. Each module begins with the identification of its Mathematical Focus and the Potential Challenges and Misconceptions associated with those ideas. In the Classroom then suggests instructional strategies and specific activities to implement with your students. A section on Meeting Individual Needs offers ideas for adjusting the activities to reach a broader range of learners. Each activity is supported by a reproducible, and References/Further Reading provides resources for enriching your knowledge of the topic and for gathering more ideas. Linda Dacey is the professor of mathematics and education at Lesley University.